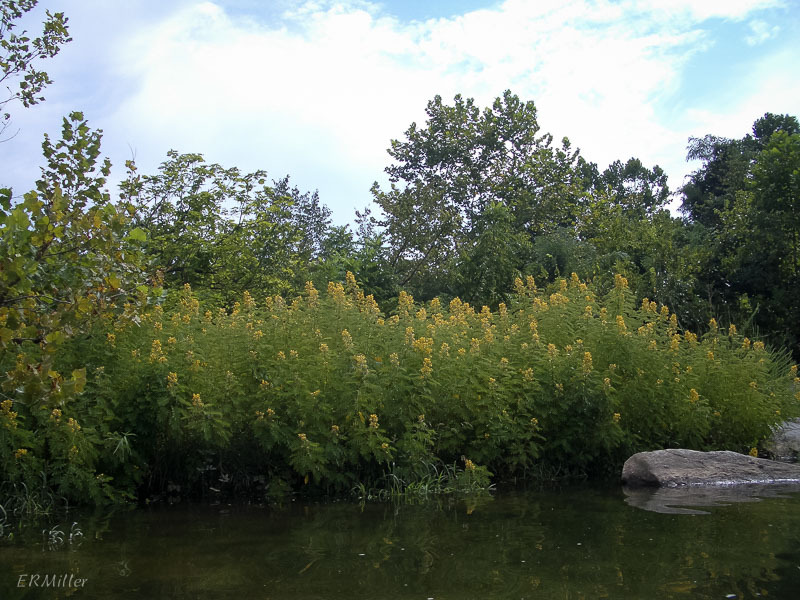 While kayaking in the lower Potomac Gorge I saw large stands of senna lining the shore, the plants so tall they could be mistaken for shrubs. But they’re not. They are herbaceous perennials that can grow as tall as six feet by the time they bloom in late summer. The two species are quite similar in appearance. A leaf of S. hebecarpa generally has 5 to 10 pair of leaflets, which tend to be a grayish green. S. marilandica has 6-12 leaflets per leaf, and sometimes these have a bluish cast. Neither of these characteristics is a good way to distinguish one species from the other, though. You need to take a close look at the flowers. S. hebecarpa flowers have very long pistils with spreading white hairs. S. marilandica pistils are much less obvious. And that’s about it. Both species are native to the eastern US, with S. hebecarpa going (like the Appalachian Trail) from Maine to Georgia, then west as far as Wisconsin. It’s listed as special concern in Connecticut, endangered in Massachusetts and New Hampshire, threatened in Vermont, and historical in Rhode Island. S. marilandica only grows as far north as New York, but can be found further south, into Florida, and west to Texas and Nebraska. There are no conservation issues with this species. The USDA Plants database does not have county records for the state of Maryland, but shows S. marilandica there. The Maryland Biodiversity Project has no records of it in the state. The one shown at top is growing in my garden. It’s a tough plant: sennas are usually found near riverbanks, where they get plenty of water and sun. Mine is shaded by redbuds and at the top of a slope; the soil could be described as mesic at best. But the plant is thriving. this is not the one in my garden! Various websites describe it as “coarse” and “stunning”. Beauty is in the eye of the beholder. If you fancy native plants in your garden, give this one a place near the back, with plenty of room to grow up and out. And be prepared to stake it if it’s in any shade, else the stems will flop right over under the weight of flowers and seedpods. Taxonomic note: the specific epithet “hebecarpa” is from the Latin and could be translated as “downy seed”; “marilandica” of course means “of Maryland”. 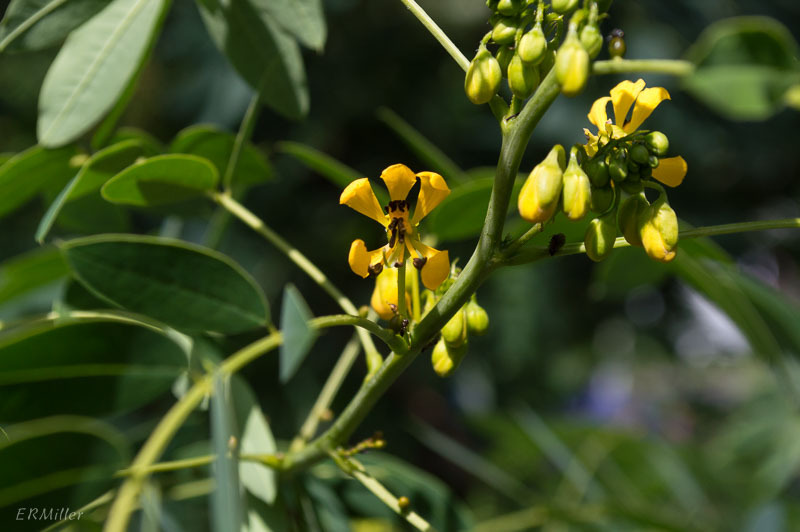 This entry was posted in Uncategorized and tagged American senna, Fabaceae, Maryland senna, Senna, southern senna, wild senna by elizabeth. Bookmark the permalink. 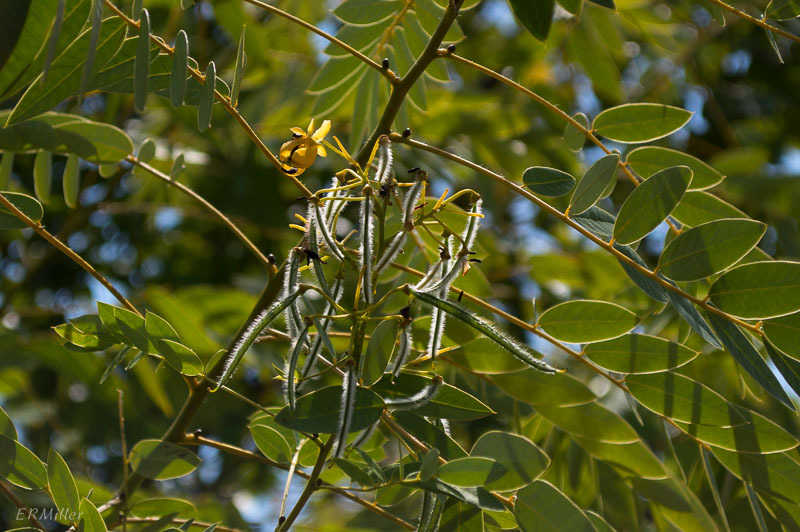 The four species of Cassia [now split into Partridge Pea, Large (Chamaecrista fasciculata) and Small (Cham. 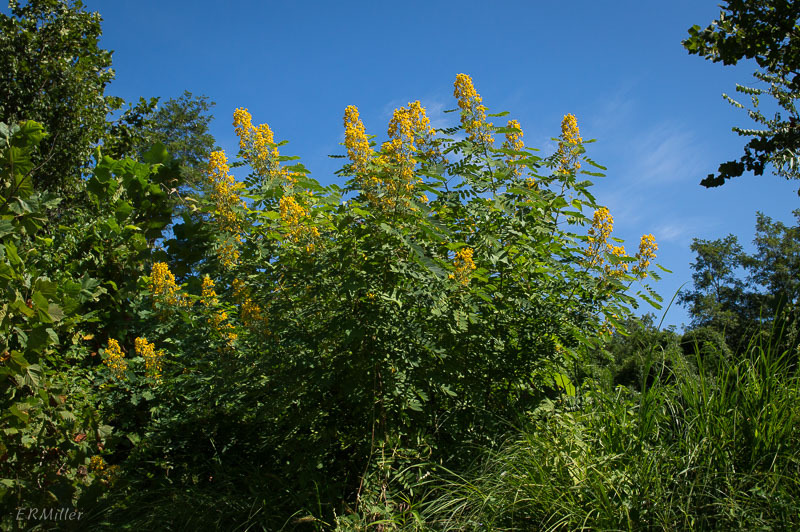 nictitans) and Wild Senna, American (Senna hebecarpa) and Maryland (S. marilandica)] in MD are easily distinguished from each other during the growing season. Near the base of every petiole is a gland which is a slightly different shape in each of the four species. The annual Partridge Peas are relatively small and rarely get over two feet tall with leaflets less than an inch long. The perennial Wild Sennas are almost shrublike and often get over four feet tall with leaflets usually at least an inch long. The gland on American Wild Senna is a knob on the end of a short stalk. 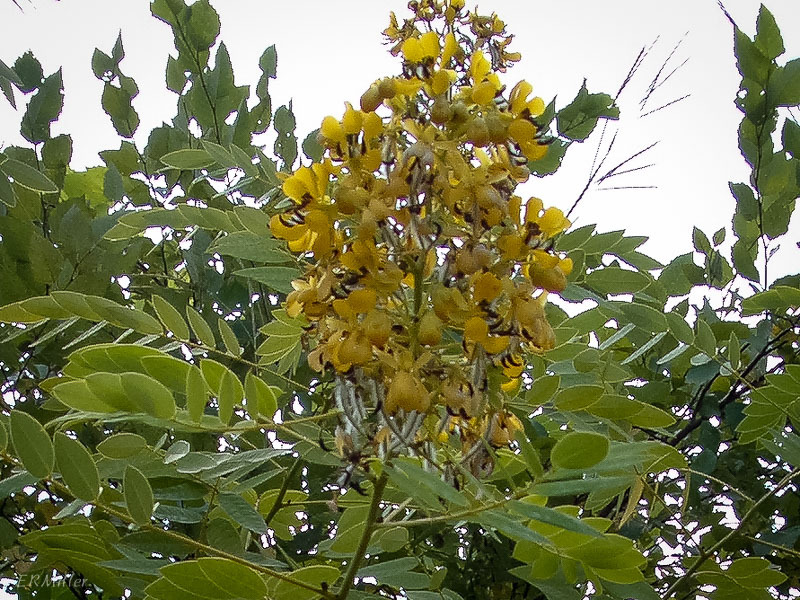 The one on Maryland Wild Senna has no stalk. Large Partridge Pea has no stalk and is shaped like a saucer while Small Partridge Pea has a gland with a stalk that looks a little like a mushroom. There are drawings of this in Herbaceous Plants of MD (Brown and Brown, 1984) showing the placement on the petiole with an enlargement of the gland on page 567 opposite the description and the key of the Genus Cassia.